We’re touring towns in the region of Venice called the Veneto. Basically it’s the area we didn’t make time for before because of well, Venice. 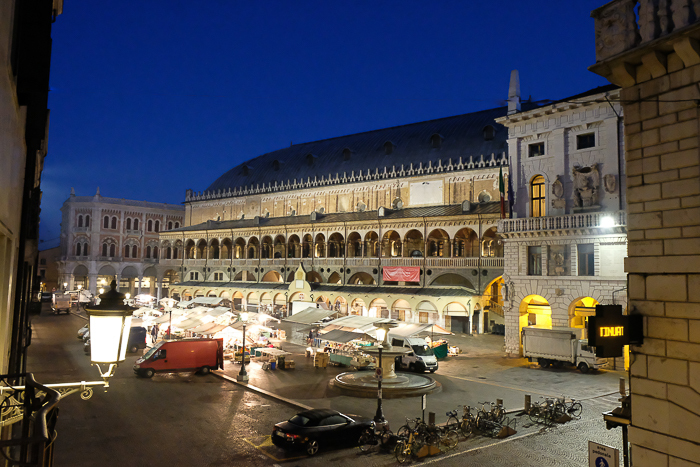 We base ourselves for the week in the city of Padua. Our apartment owner, Sara, reminds me of my Czech cousins with her sprightly personality and dark cropped hair. 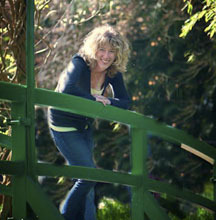 In her early 20’s, Sara lives at home with her parents and helps manage their handful of Paduan apartments. Sara met us on the front stoop, arriving on her purple bike with a lavender scarf wrapped around her neck. She took more time to explain the apartment than any owner has ever done for us, including how to run the clothes dryer (not as easy as it sounds here.) Sara’s mom, an artist, adorned our walls with her colorful work. The heat in our apartment works great, as does the shower, and reaching the unit requires just one set of stairs, which are not made of glass. We sit directly atop a boutique shop selling perfumed soaps and colognes. Scent-wise, I am in heaven. Italians have yet to embrace America’s aversion of carbohydrates. But maybe because they eat in moderation or because they walk everywhere, you rarely see an overweight Italian. 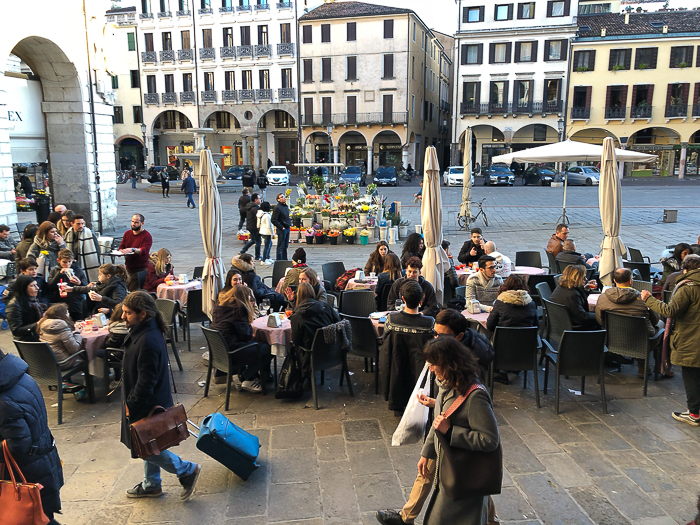 Purely out of cultural sensitivity, we adopt the Italian way of eating during our travels. For us that means plenty of bread and pasta, plus regular indulgences of dessert. 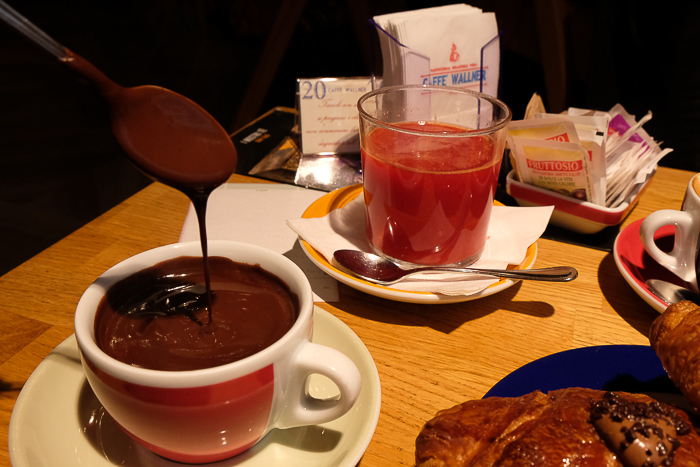 4-5 AM: Jet-lag pre-breakfast of coffee and milk (milk of unknown variety--we usually stick with the smiling Italian kid on the carton) and grocery store chocolate croissants. 10 AM: Café break (sustenance from strenuous touring) of chocolate croissant (much higher quality than grocery store variety) and cappuccino. 1 PM: Large lunch at real food restaurant, preferably owned and operated by authentic Italian familia. Bottled water for me (“no gas” = non-carbonated water) and glass of house red wine for James. Wine often comes cheaper than water. Mixed salad for me with array of greens and veggies, always served with bottles of olive oil and vinegar. Jim sometimes orders caprese salad. Ravioli for me, stuffed with cheeses, spinach or squash (aka “pumpkin”). Other pastas with meat (hopefully beef) for James. Yesterday in Verona the menu included items like stewed horse, raw beef, “pasta with liver,” and an array of boiled meats. The suited businessmen at the adjacent table ordered the meat platter. The matron of the establishment rolled out a huge tray of boiled meats of various shapes and shades for their selection, including “tongue and brain and nerves on requests.” It reminded me of cheese or dessert trays, but with animal parts. For us, dessert usually involves some type of chocolate. We worry less about translating the dessert menu because it’s tougher for them to slip in stuff like intestinal meats. 6 PM: Snack of gelato, grapes, or whatever other treats we have hanging around our apartment before our jet-lagged bedtime of 8 PM. 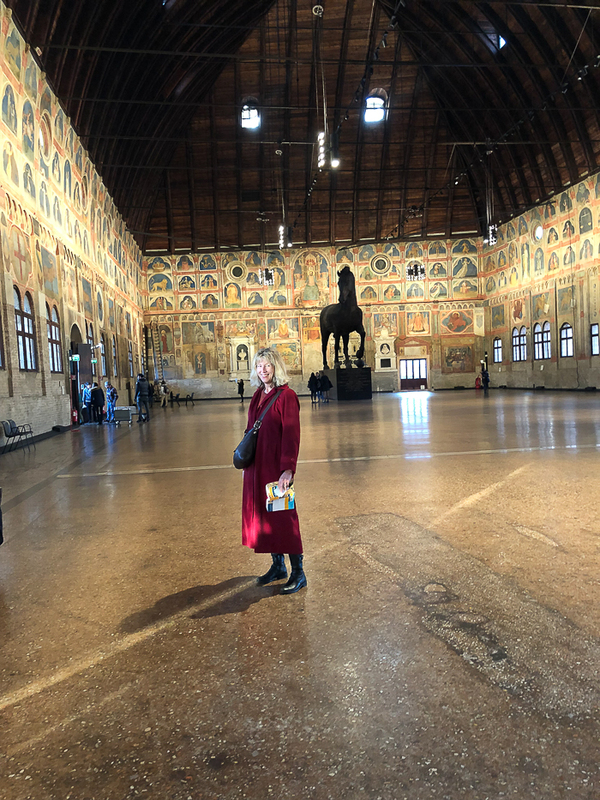 Verona boasts a largely intact Roman arena which through the centuries has hosted everything from gladiator battles and medieval executions to today’s rock concerts and opera festivals. During World War II, the arena temporarily suspended the entertainment while it served as a bomb shelter: the 2,000 year old construction offered the sturdiest option around. 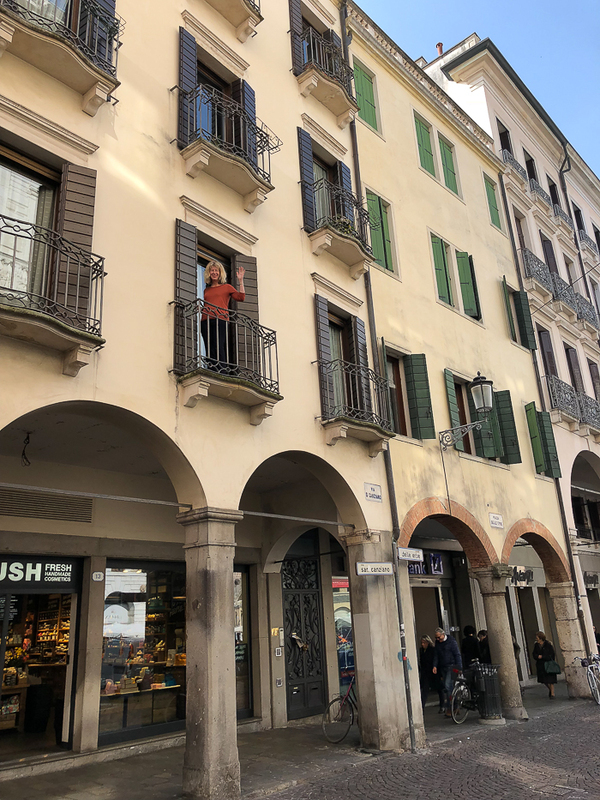 Of course we had to stop at the Juliet balcony while in Verona, a manufactured site invented by a clever tour guide in the 1970s. The fakery doesn’t prevent the crowds (including us) from visiting this courtyard. You can pay six euros to climb up to the balcony itself and to see Juliet’s grave. Juliet’s grave? People know she was a creation of Shakespeare, right? 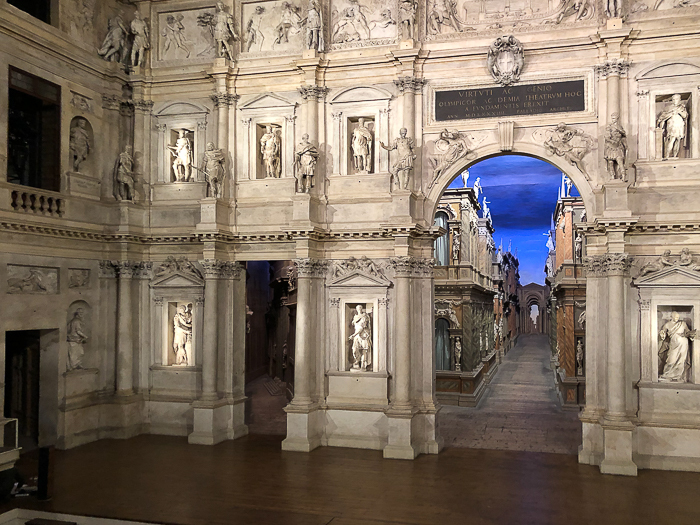 Italians are amazed at the 1,600 Japanese tour groups that blaze their way annually from Venice to Milan, stopping only once--to see Juliet’s fake balcony. Lovers buy small red locks from a shop in the courtyard to add to a removable metal grill opposite the balcony. Lo and behold, my Jim whipped out a little lock of his own from his pocket. He’d carried this lock from Salem (purchased at True Value Hardware), inscribing our names and the date with a Sharpie. My sweet, romantic guy! And my Romeo is actually real. But back to Van Gogh. We barely beat the busload of 2nd graders inside, a rambunctious group, exactly as seven year olds are designed to be. They took about 20 minutes to unload all their little duds at the mandatory bag & coat-check so we bolted upstairs to get a calmer jump ahead of them. The exhibit had tons of Van Gogh’s drawings and a handful of his lesser-known paintings spread throughout a series of spacious rooms. Unlike most of Italy, nothing was in English--not a sign, a video nor a bookmark in the gift shop. We switched to whispers while wondering how these delicate flowers of security were ever going to manage the chaos that awaited them in the floor below. As we moved room to room, our wardens and their cohorts tailed us each step of the way, scoping out our every move. It was as if we’d been marked as trouble-makers, and they’d texted their colleagues in the rooms ahead that we were not to be allowed out of sight. The final room had no art, just a diorama display of the mental hospital where Van Gogh spent his final years. The diorama consisted of a cheesy mock-up of St-Remy hospital and grounds, complete with pieces of sticks for trees. Even here, we were tightly monitored. After we left, we saw arriving hoards of fired-up children of all ages congregating out front. The non-touristy city of Padua offers two blockbuster sites, the Scrovegni Chapel and the Basilica of Saint Anthony. draws art historians world-wide for its Giotto frescos. Enrico Scovegni, a wealthy banker, commissioned Giotto to decorate his chapel as an offering to the Church in hopes of easing his corrupt father’s way into heaven. Giotto completed these revolutionary frescoes in 1305, spurring the start of Renaissance art. Due to the fragility of the frescoes, just 25 visitors can enter at a time, and only after getting de-humidified in an ante-chamber. Our group consisted of a bunch of college students and a couple of enthusiastic English women of about age 70, one requiring a cane. 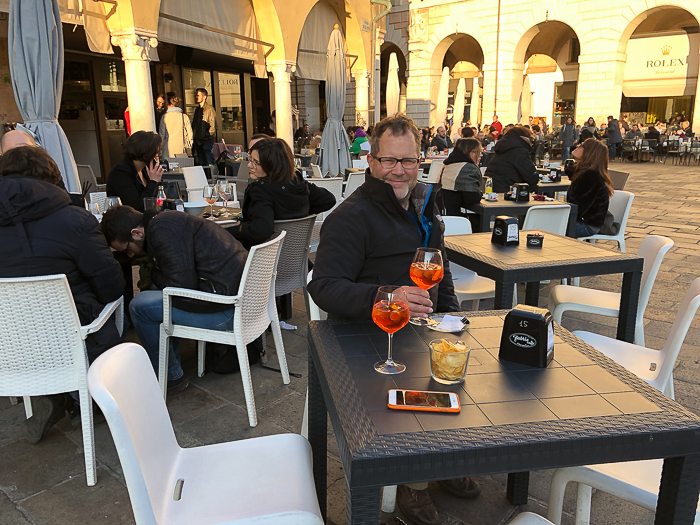 We waited with our new Brit friends on the outdoor benches in the 39* F weather, the cane-user still perspiring following a labored hike from the train station. Concerned, Jim and I kept an eye on her. But they were a delightful pair, these English ladies, thrilled to be seeing the Scrovegni Chapel for the first time. “We’re historians,” they explained. “The Renaissance happened thanks to this. Giotto’s frescos started it all!” They’d waited decades for this moment. Finally it was time for our group to experience our precious 15-minute allotment in the Chapel. We all filed in, quietly, reverently. Jim and I scooted to the rear of the room for a good perspective. Wow, I thought. Which of these students has the audacity to play pop tunes in this hallowed of circumstance? Jim wondered the same thing. I started mentally grooving to the beat, like my own personal soundtrack to Giotto, but then I got worried. The music seemed to be coming from Jim. “Jim, is that you?” I whispered. “Yep,” he mumbled, stealthily turning off his phone, having accidentally hit play in his pocket to his collection of girl-power songs. I made no confession to the English ladies. 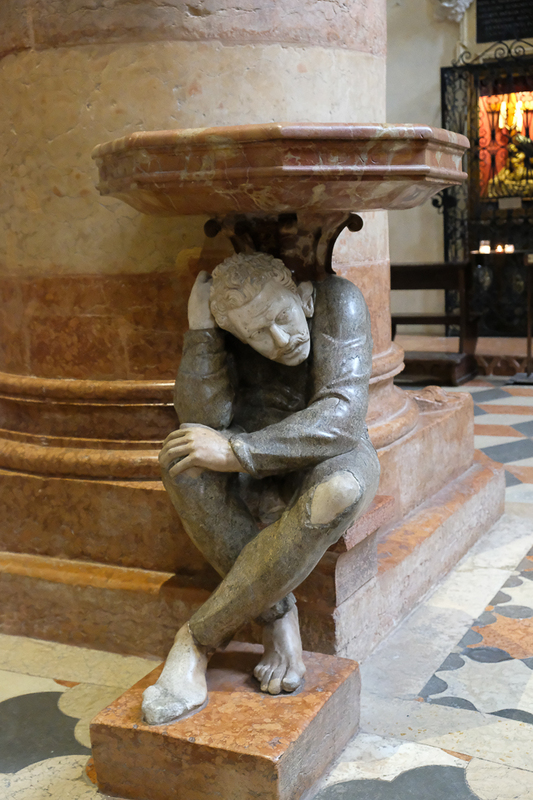 As far as I know, nobody was ever the wiser about Jim in the Scravegni Chapel. We weren’t quite so fortunate at Saint Anthony’s Basilica, a pilgrimage site honoring the protege of our favorite saint, Frances. Anthony’s known as a wide-ranging intercessor--for travelers, amputees, donkeys, pregnant women, infertile women, and flight attendants. He also assists the faithful in locating stuff, from a spouse to a set of lost keys. Behind the altar you can view Anthony’s tongue, vocal chords and intact mandible (he maintained a healthy dentition, we noted). I started reading aloud to Jim from our guidebook while standing near the tomb that held the rest of Anthony when a monk approached and asked that I kindly lower my voice. My turn to get busted. As we headed toward the exit, I spotted another monk in a side chapel blessing a kneeling couple. I’d read about this, thought it lovely, and I wanted it, too. Jim wasn’t so sure, but I coaxed him in. “Do you speak English?” I asked the monk after the other couple had left.